Do you have a curious nature? I’ve long admired the work of Parson Gray (aka David Butler), delighted to come across a line which was masculine but not novelty. At this point I had a plan to make a quilt for my eldest brother (I have four brothers in total!) 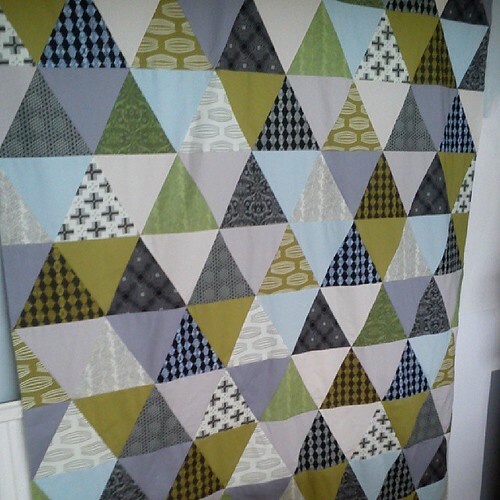 I’ve had a desire for a while to make a triangles quilt and this seemed like a good opportunity to carry that out. I bought a 60 equilateral triangle ruler from Creative Grids, I’m sure I could have cut them using a normal straight ruler but I knew that it would be quicker and simpler to invest in a ruler and I’m really glad I did. The layout didn’t take long, I decided to use the solids pointing down and the prints pointing up and laid all the blocks out on the living room floor, moved a few around and then piled them out ready to piece. The backing possibly took me longer to piece! I had a stash of Nigella (Amy Butler) home decor weight fabric and thought it would work brilliantly for the back, once I pulled it from my stash I realised I didn’t have quick such big pieces as I thought so I did have to do a bit of piecing (and maybe a little stretching!). I quilted wonkily organcially approx 1/4″ either side of every seam line using Aurifil 2310 50 weight, it’s a fairly neutral colour and worked well with all the colours in the quilt. I bought a 15m roll of Super-Soft 70/30 Eco-Blend by Sew Simple and used some of it for the first time in this quilt. The quilt felt heavy while I was quilting it but some of that could be due to the weight of the home decor weight fabric too. The wadding seems denser than the Hobbs 80/20 that I’ve been using for the last few years, but it has a nice feel to it and the price of the Eco-Blend was good so I’m pleased that I made the investment. I’m amazed at how it looks from a distance. We went to the park on Saturday and Tobi went off and took photographs so I didn’t see it hanging up but was really surprised at the photographs, it looks a lot lighter than I was expecting and I love it. All I need to do now is label it and it’s all ready for gifting at Christmas. I had a stack of triangles left over, I hope to show you soon what I’ve done with them (although if you’re on instagram you might have already seen). What a perfect quilt! 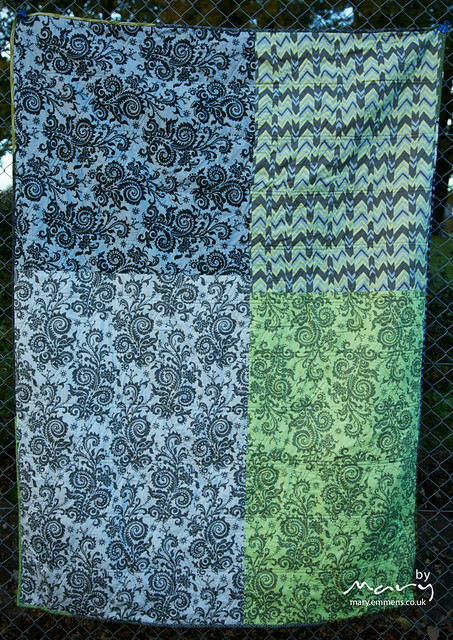 I love the pattern, fabric and quilting! 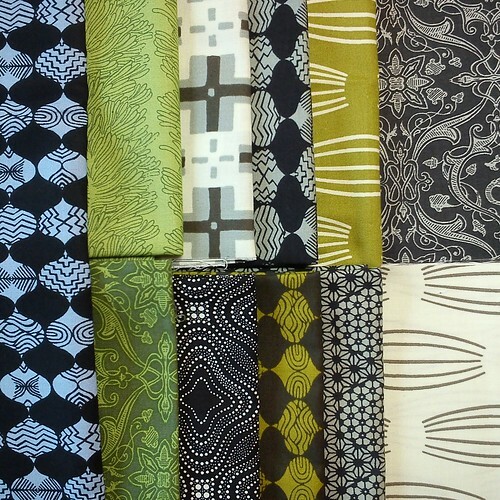 The pattern is perfect for these fabrics. Absolutely beautiful make, M. The colors are beautiful and perfect for a fella. I just love this quilt. The random placing of the prints and solds, and the colours, it all works so well. Gorgeous! I have to agree it looks so different and much lighter from far away! 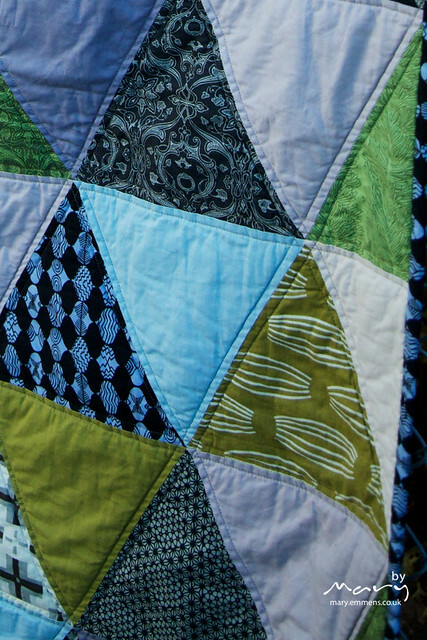 Great quilt, I love how you’ve set out the solids and prints. I made my brother a quilt a couple of years ago and had to search high and low for appropriate fabrics, unfortunately it was a few months before this range came out otherwise I would have used it. I bet your brother will love it. 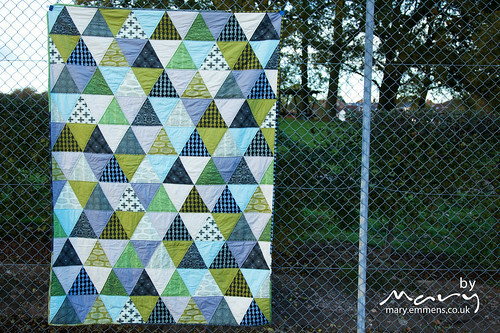 Such a great quilt, love the solids in there! This is great! 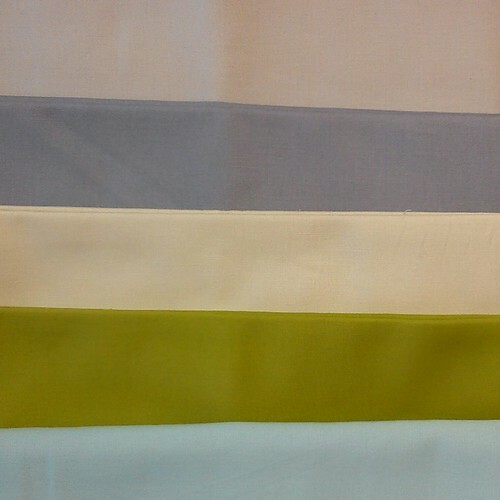 And what a lovely fabric range that is- I wasn’t sure at first but used together it’s really really nice.